If you’re hoping to replace your MacBook this summer, you’ll have to wait. Apple kicked off its World Wide Developer Conference in San Francisco today with announcements about Siri, iOS 10 and Apple Watch, but there were no iPhones or MacBooks in sight. While we’ll still have to wait for new devices to play with (likely coming in the fall), we got to see several new updates that we can’t wait to get our hands on. Let’s check out the highlights from WWDC 2016. 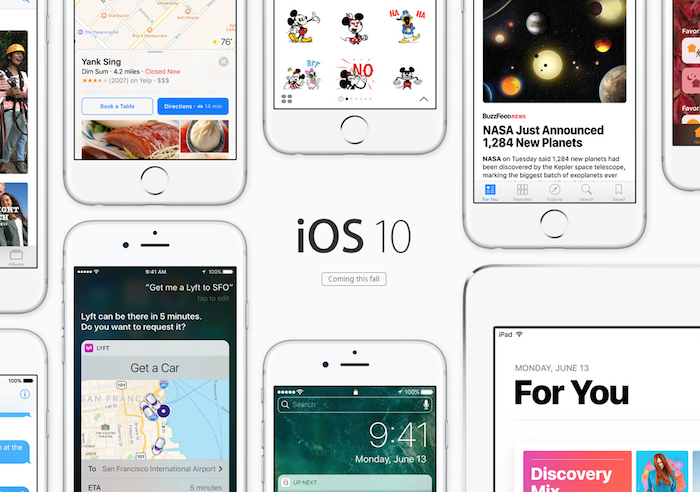 Apple’s mobile operating system is getting a few fun, interesting updates. The Messages app in iOS is getting bigger emojis, special effects that make your messages move, invisible ink messages, stickers and handwritten notes. Your messages will never the look the same. One big new feature is called Raise to wake, which shows the lock screen and notifications when you lift your phone. In iOS 10, you’ll able get to use 3D Touch on the lock screen to interact with notifications, such as responding to a calendar invite or replying to a text. And for those of us who hate to listen to voicemails (guilty), iOS 10 will transcribe messages into text so you can read them instead. Siri gets a lot smarter too because she’s able to interact with apps on your phone to send messages, summon a ride or send money. Other updates include automatically-created photo albums in the Photos app, new features in the Maps app, and a makeover for Apple Music. Apple’s computer operating system OS X is now renamed macOS and the next update is called Sierra, coming later this year. With the update, you’ll be able to use Siri on your computer to search for files, play music, send a message or search the web. Basically everything she can already do on an iPhone or iPad, she can now do on a Mac. With macOS Sierra, you can also unlock your Mac with your Apple Watch, without typing in a password. Another change lets you make online purchases with Apple Pay on the Mac. Apple’s also updated its storage service iCloud and created a universal clipboard that lets you copy text on your iPhone and paste it on your Mac. Nope, there’s no new Apple Watches yet. Instead, Apple announced updates to the software running on the watches already out there. There are three new watch faces; a Minnie Mouse, one that shows your activity circles and a simple option with large numerals for the hour. While we’ve already been able to get and reply to texts on the Apple Watch, now we can draw on the watch screen to reply. This feature is called Scribble and you just draw the letters you want to create a message. Finally, if you’re trying to get healthy, Apple Watch now lets you compete against friends for your movement and activity goals. For those who need some stress relief, a new Breathe app guides you through deep breathing exercises. And if you ever need immediate help, the Apple Watch can now call emergency services for you. It’s called SOS and it can even send your location and medical information to 911 operators and EMTs. All of the updates to iOS, macOS and the Apple Watch will arrive in the fall, according to Apple. We can’t wait to try them out.